Thunderstruck II is a Microgaming slot machine and the second title in a series dedicated to Thor and his hammer. The Norse theme has been better approached in this title I think, but the design is still not quite to the level where I wanted to see it. Still, its features are much more interesting and there is more variety there as well. On top of that, the ways to win system was preferred for this title, and it tends to make things a lot more fun. It’s not the only Thor themed game available out there, but it does do a pretty good job at representing him and the other gods of the Vikings. You still get 5 reels in Thunderstruck II, but now they are covered by 243 ways to win instead of paylines. 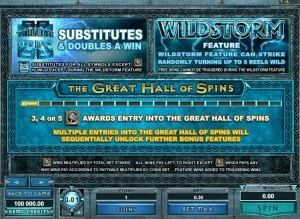 The game has some very cool free spins that you can trigger, plus scatter symbols, wilds and multipliers. As for the top prize, you can get $500 from it. 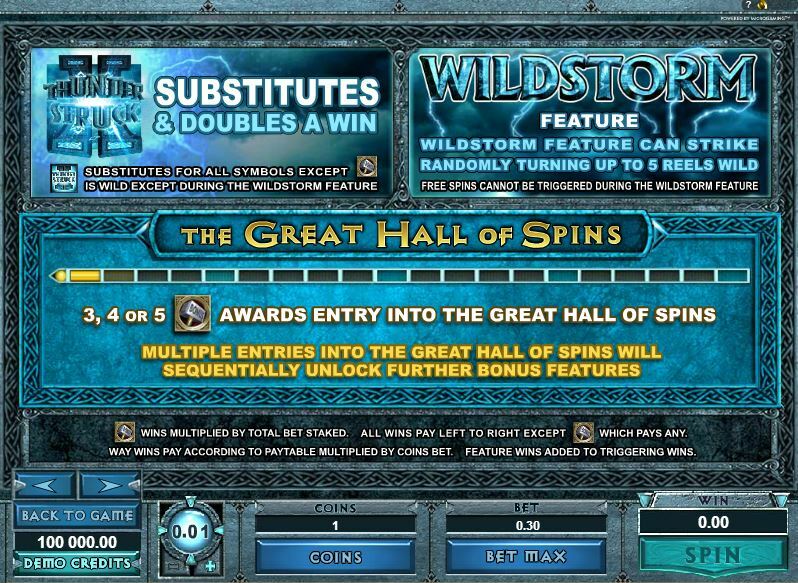 Among the features offered in Thunderstruck II, which are much better than in the first title, you will find the ways to win, the wilds which apply multipliers, the Wildstorm feature and the Great Hall of Spins, with its four types of free spins. 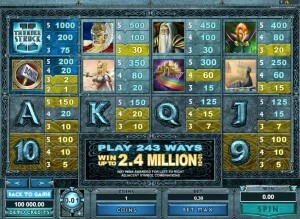 243 ways to win were chosen for this game, over the more classic payline system. While paylines have fixed positions where they need the symbols to be in, the ways to win only ask them to be on neighboring reels and going from left to right. 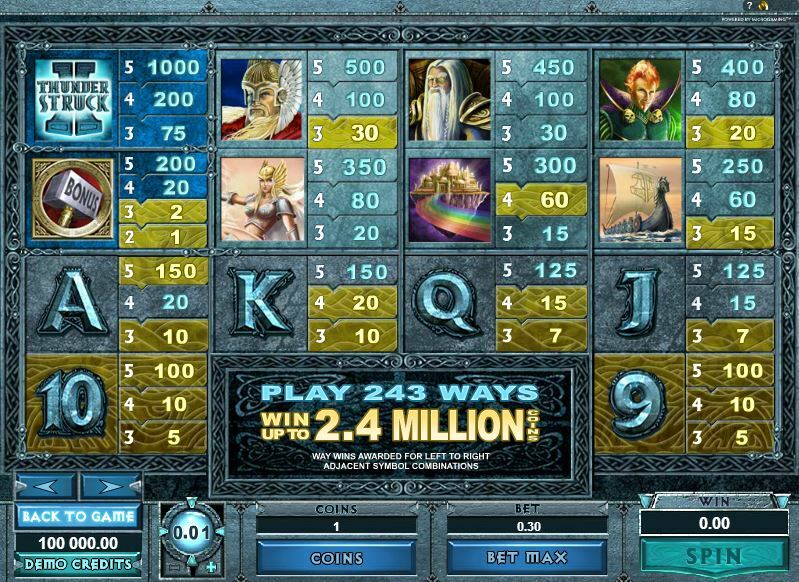 Games which use ways to win tend to offer wins all the time, but they’re going to be smaller than those from the slots with paylines. With the Thunderstruck II Logo being present among the symbols, you will find that its role is that of a wild that applies multipliers. Get that wild symbol to substitute for other icons, and you will be rewarded with a 2x multiplier that doubles the prize of the win. Wilds offer their own prizes as well, with the 1,000x wins being the best that the game has to offer. A scatter symbol is part of the slot’s paytable, represented by Thor’s Hammer. It’s the trigger for the free spins, while also paying up to 200 times the wager as a prize if you have enough of them present. The free spins take an interesting form in this game. You have four types of free spins, which you unlock as you keep triggering the feature. You get one type of free spins in the beginning, with three others unlocked in time. To trigger them, you need 3+ Thor’s Hammer scatters present at the same time on the reels. Valkyrie is the first type of free spins that is available, the one which is unlocked from the first time you get this feature. You get 10 free spins and 5x multipliers for all the wins. You can also retrigger the free spins. 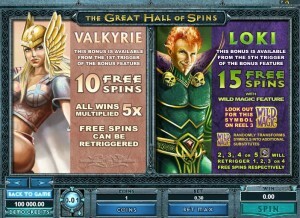 Loki is next, available when you have at least five rounds of free spins triggered. 15 free spins are available and they come with the Wild Magic feature. This feature brings you a wild symbol on the 3rd reel, which will turn other symbols at random, into additional wilds. You can retrigger between 1 and 4 free spins, with 2 to 5 scatters. 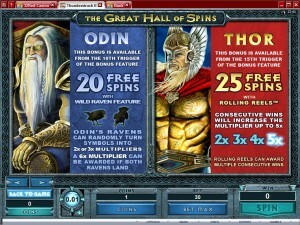 Odin is the third free spins mode, available when you trigger the free spins for the 10th time. 20 free spins will be given to the player at this point, with a Wild Raven feature active. These ravens will come in and turn symbols at random, into multipliers of 2x and 3x. When both ravens land, you can get a 6x multiplier. 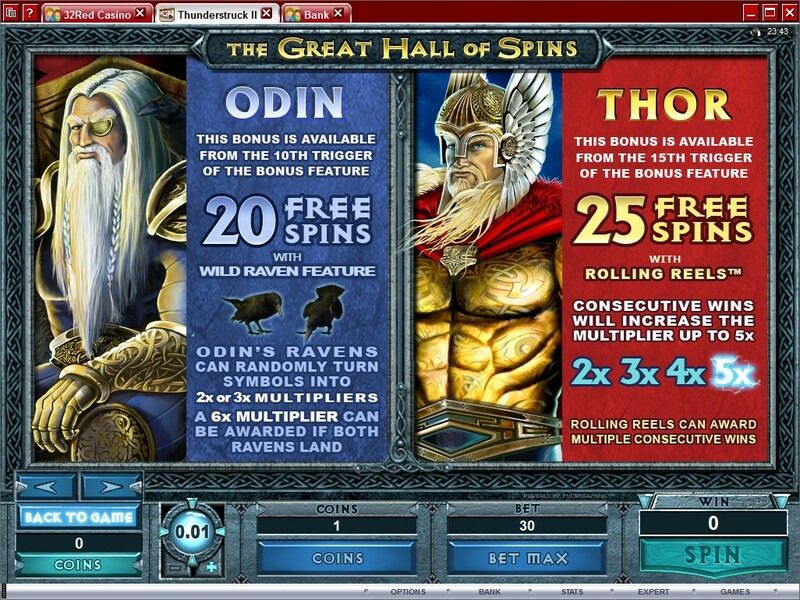 Thor is the fourth and final type of free spins. You need to get the free spins at least 15 times before you can activate it, but you will receive 25 free spins from it, with Rolling Reels. When you get consecutive wins from the Rolling Reels, you will get multipliers that keep growing, as high as 5x. A line bet in this case means that you have to use between $0.01 and $0.50. You get to wager on 30 lines at all times, which is enough to activate the 243 ways to win. The maximum bet is at only $15. The rewards offered by the game are OK at 1,000x, given the nature of the paylines, but the value will be rather low, only $500. The 200x the bet prize from the scatter symbol means up to $3,000 though. The design of Thunderstruck II is better than the one from the first slot, but the improvement is not as big as it could’ve been. The cartoon style design has been replaced with a style which makes them look like drawings in a book about the Norse gods, making them look majestic. However, you still get playing cards, and while they appear to be made out of stone, that doesn’t mean that they’re not boring to look at. Symbols: Thunderstruck II Logo (wild, 1,000x), Thor’s Hammer (scatter, 200x the bet), Thor (500x), Odin (450x), Loki (400x), Freya (350x), Asgard (300x), Viking Longboat (250x), Ace (150x), King (150x), Queen (125x), Jack (125x), 10 (100x) and 9 (100x). I’m a big fan of the kind of free spins you get in Thunderstruck II, and the ways to win make it fun as well, but they come with rather low prizes and the graphics are only about average. 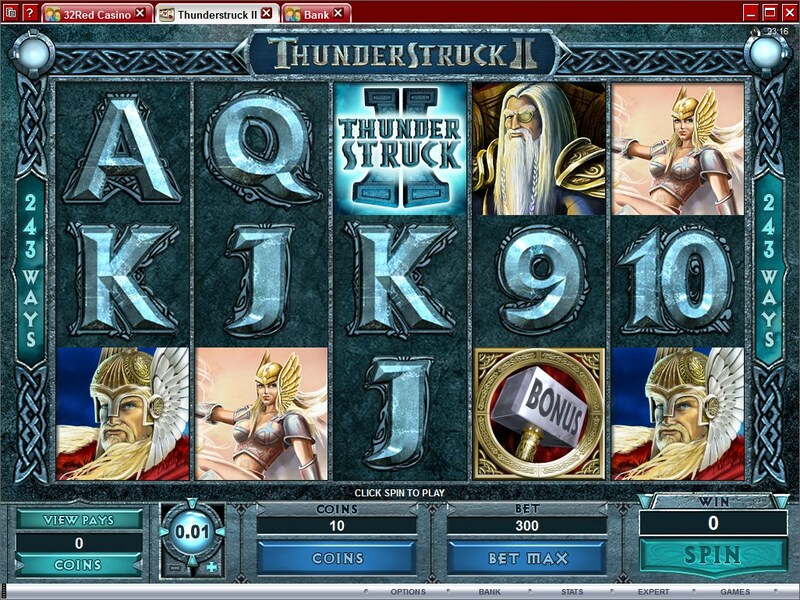 You will find Thunderstruck II at any online casino which chooses to use software from Microgaming, playable either for free or for real money.